We're passionate about the jewellery business. That's how we've been helping customers for 2 decades now and still love what we do. Andrew & Judy attend Nationwide timeout conference in Canberra. Highlights of the trip include the very informative seminars and dinner at the Australian War Museum. In March, Cameron's Jewellers celebrates 20 years in the Jewellery industry, 20 years as a Nationwide Jewellers Member, and 20 years as a Swarovski Dealer. What an achievement. In June, as guests of the National Council of Jewellery Valuers (NCJV), Andrew and Judy attend the Cartier Collection in Canberra. An incredible history of the Jewellery industry. In August, Andrew, Judy & Hope all complete "Industry Best Practice Course" with Colin Pocklington in Melbourne. In August, Andrew, Judy & Hope attend the 2018 International Jewellery Fair in Sydney. Here they extend their knowledge with all things jewellery related & see all the latest fashion trends on the market. Nic & Erin get married in April, a beautiful family occasion. Andrew and Judy travel to Fiji in June for Nationwide's international Timeout conference. 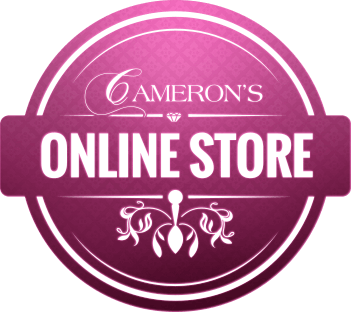 Cameron's launches new online store and website in July. Andrew & Judy travel to Antwerp, Belgium in September for their annual Diamond Buying Trip to buy diamonds for their clients. Andrew & Judy visit the Swarovski Crystal Palace in Innsbruck, Austria which was a Lifetime dream for Judy. We held our 10th Annual Swarovski VIP event. With a new location and our clientele it really made the day as enjoyable as every other event. Judy and Andrew ventured off to America in May/June for the Nation Wide Jewellery fair/conference. They came back with new and exciting things & Judy can't wait to share it with everyone! Andrew, Judy, Hope, Phil, and Baby Jackson all travel to the Gold Coast for the Nationwide Time out conference. Very informative conference filled with a bit of fun as Phil won the golf competition. Andrew and Judy travel to Los Vegas in June 2016 for the JCK Jewellery fair. 5 days of conferences, networking, and discovering all the latest trends in the Jewellery industry. Hope and Phil get married in October, wonderful time had by all. We held our 9th Annual Swarovski VIP event in February, this continues to be a well attended and fun day for our loyal Swarovski clientele. Andrew graduated as a qualified Diamond Technologist in March. Andrew and Judy also travelled to Auckland, New Zealand in March for the Nationwide time-out conference. Here they attended a conference and workshop on using Social Media successfully. A great time was had by all the Nationwide 'family'. Andrew began his studies in CAD design using state of the art software and technology. In April Judy and Andrew travelled to DeBeers diamond mind in Botswana, Africa. This proved to be an amazing educational experience seeing diamonds being mined and seeing their new cutting and grading facility. In September we had another successful trip to Antwerp to buy diamonds for a very special clients. October saw us invest in a new engraving machine for our workshop. We can now engrave photos onto many different surfaces. We held our 8th Annual Swarovski VIP event, we are currently the biggest dealer in Swarovski crystal and jewellery in Northern Victoria. Andrew is currently studying Diamond Technology with the G.A.A. At the end of this year Alex completed her Apprenticeship and became a fully qualified Manufacturing Jeweller. We are so proud of her efforts. Andrew and Judy have a one-on-one diamond cutting lesson with Gabi Tolkowsky whilst on their annual diamond buying trip in Antwerp. What an honour! Andrew completed his Diploma in Gemmology through G.A.A. While we had a social media presence on facebook we also launched our first website. This included pages for all of our services, displayed examples of our work and we also introduced an education centre to help our customers care for their jewellery. Judy and Andrew travel to Antwerp, Belgium to choose their own diamonds. Judy and Andrew travel to Thailand to visit the Institute of Gemmology and buy rubies and sapphires. Nathan competes in World Skills Australia and comes 4th in the Australian Competition in his field. Nathan has sudden cardiac arrest while playing football and passes away. He was 19 years old, our beloved son. Andrew defers from his diploma in gemmology for one year. Hope Beasy joins our team as Store Manager. Judy, unable to serve because of her sad face, works on Cameron's Fine Jewellers website, cfj.com.au and the CFJ Facebook page. Judy also continues staff training whilst only serving clients for custom makes. Judy and Nathan do Jewellery Drawing course with Rex Steel Merten. Nathan graduates as a Manufacturing Jeweller. Andrew starts his diploma in gemmology. Judy and Andrew travel to Antwerp to personally select diamonds for their custom make clients. Purchased a Laser welder for our workshop, only 6 such machines in Australia at that time. It can laser weld to 1 tenth of a millimetre. Andrew and Judy meet Gabi Tolkowsky, the worlds most famous diamond cutter. Andrew becomes a certified Diamond Grader G.A.A. Closed Import Bazaar in December to concentrate more on our Jewellery Store. Travelled to the Hong Kong International Jewellery Fair to experience the international vastness of the jewellery industry. Andrew becomes an Antwerp Diamond Broker in an official ceremony at HRD Headquarters in Antwerp, Belgium. Cameron's Fine Jewellers are named 'Member of the Year' for Nationwide Jewellers in competition with over 500 stores Australia wide. Our son Nathan Cameron joins the family business as an apprentice manufacturing jeweller. Our inaugural Swarovski VIP event is held outside our store, personal invitations were given to our top 100 Swarovski clients for afternoon tea. Travelled to Antwerp, Belgium to buy diamonds direct and pass savings for these diamonds on to our clients. Employed Dave Norris, Master Jeweller. Went 'live' with SWIM software, created just for jewellery stores. Started offering custom made jewellery and custom re-modelling services. Workshop is now fully equipped to manufacture on site. Established Cameron's Fine Jewellers workshop, starting with both intricate and basic repairs. Judy started a deportment program for school aged children to work after school and during school holidays. The program includes life skills like goal setting, selling and learning to sell yourself in interviews, merchandising and all aspects of retail. Some of Judy's girls have gone onto to become; police officer, speech pathologist, school teacher, career in retail, accountant, etc. Judy completes the course by Brad Huisken, "Relationship Selling Program" and begins a program of ongoing training for all staff members in the art of selling and communicating. Participated in the inaugural St Mary's shopping spree (Judy helped create this event). This was a successful fundraiser for St Marys school in Swan Hill and was held each year for seven years. After months of planning we opened Cameron's Fine Jewellers in June. Andrew completed Diamond Grading certificate 1 & 2. Purchased a computerised engraving machine. Judy and Andrew Cameron purchased Import Bazaar in Campbell Street, a gift and small jewellery store. We joined Nationwide Jewellery Group. We continue our contract with Swarovski Crystal. Clients indicate that they are happy to buy jewellery off us but the gift store layout lacks privacy.